Home Revival: Results are in…. 406 Reetz Ave is a winner. This home has been posted-tested and shown terrific results. The MaGrann report is filed for download within the left column below. We cut air changes by 60% and have modeled energy use to be just 1/3 of the consumption that had been burdened upon the previous owners. These are big numbers in any scenario. Testing staff has offered that they rarely see numbers of this magnitude in any home, much less a 70 year old shell. As of this writing the open house tours are underway. The comments are strong about reviving a home, design improvements, enhanced street scape, and pointing the way for the neighborhood. The testing and demonstration phases in home performance are on-going but ready to move to the “big show” of consumer acceptance and demand. Energy bills are shaping some impetus. Make no mistake this effort is nothing short of building a new industry around mainstreaming home performance. The road-map I see is “remodeling” the remodeling industry to ramp up skills of analysis, pre- and post- testing work, and delivering on promised performance results. It is reshaping consumer thinking from “first cost” to life cycle and operational costs being a higher priority. The goal line of reduced consumption, without sacrificing comfort and lifestyle, is an immense societal goal. This effort must succeed. The alternative, of a diminished lifestyle, is not the promise offered to future generations. We all must act now to push this energy consumption / life style equation to actionable results or the next generations will pay with lifestyle contraction. We will continue to monitor the home with Apogee software and continue postings and observations. 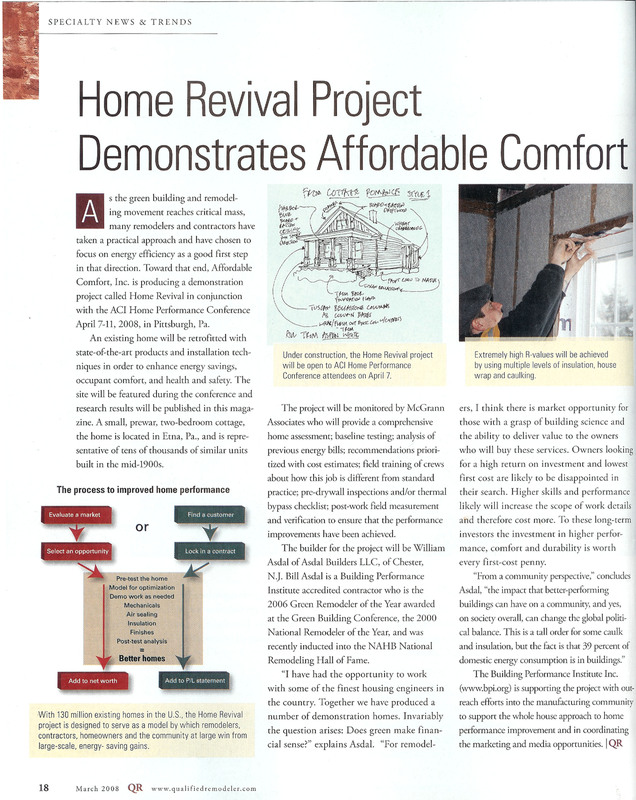 The team on board for “Home Revival” has delivered in spades on the project objectives. We are all acutely aware of the importance and challenges of work ahead on home performance contracting. This is the way we have to go. I'd add that lender thinking has to change in parallel with consumer thinking for innovation to move to the mainstream. ELECTRIC tankless water and space heating equipment.